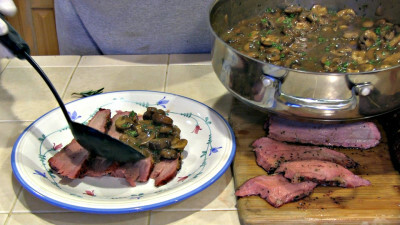 SmokigPit.com - Beef Tri Tip Marsala Recipe - slow cooked on a Yoder YS640 Pellet smoker. 1 Lbs. Baby Bella Crimini Mushrooms Sliced. Beef Tri Tip has long been my favorite cut od beef. This recipe puts a gourmet twist on Tri Tip roast the is sure to please. We will start this recipe with one large 3 1/2 - 4 1/2 lbs Tri Tip roast or two smaller ones. You can get buy with one smaller roast but after you taste this recipe you will wish you cooked two. Pre-heat your cooker to 225 degrees fehrienhight. In this cook I'm using "American Hickory" wood BBQ pellets by Bear Mountain. 2 Tbsp. Parsley. Mince 1/3 cup sweet onion and coarsely chop 4 large cloves garlic. Rub both Tri Tip roasts down with extra virgins alive oil. This will help the herbs and spices adhere to the roasts. 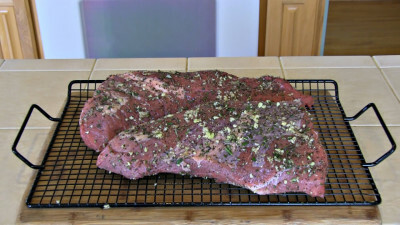 I like to evenly coat my cutting board with the herbs and spices and then roll the roasts over the herbs and spices. This allows for a nice even coat on the roasts. Place 1/2 the garlic, salt and pepper to taste evenly on the cutting board. Roll the roast over the top coating the roast evenly. Sprinkle 1/2 the Rosemary over all sides of the roast. Repeat this process on the second roast. Coat a smoking rack with PAM and place both roasts on the smoking rack. 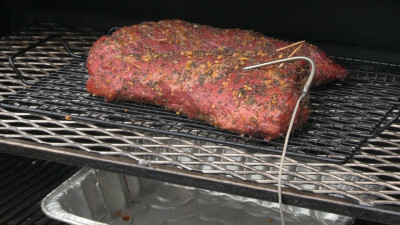 Use of a smoking rack makes transfer and clean up allot easier. Place the roasts in your cooker and cook @ 225 degrees fehrienhight. The target internal temperature is 138 degrees for medium rare or you can adjust cook time to meet your desired doneness. This cook temp chart will help you determine the target temperature for your taste. 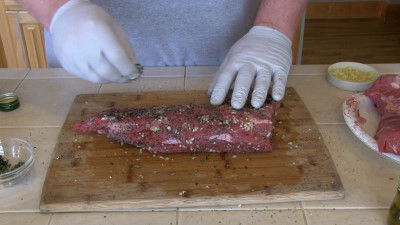 Keep in mind you will want to pull the meat a few degrees early and wrap in foil to allow the juices to redistribute. During this process the temperature should climb a few degrees. Cooking time should be around 3 to 3 hours and 20 minutes depending on heat fluctuation of your cooker and thickness of the meat. Once the Tri Tip roasts have reached the internal target temperature remove them from the cooker and wrap them in foiled and let rest for at least 30 minutes. This will allow the juices to redistribute. While the roasts are resting this is a great time to start the Marsala sauce. Using a large sauce pan melt 1 stick of butter over medium high heat. Every stove is different so be careful not to burn the butter. As the butter starts to foam dump in 1/3 cup minced sweet onion, 1 lbs. of sliced Baby Bella Crimini mushrooms, 1/2 Tbsp. Thyme and salt and pepper to taste. I used a couple pinches of each. 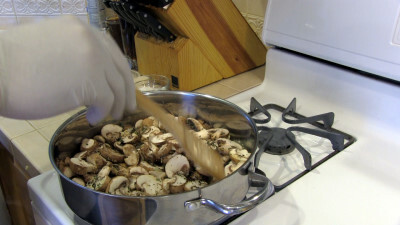 Cook the mushrooms until they become translucent or soften up. Remember to stir occasionally. Next add 2 cups Marsala cooking wine and one cup beef stock. Thoroughly stir and simmer cooking down the wine and broth. You want to reduce the liquids by 1/3 cooking off the alcohol. This will take about 20 minutes and you want to stir frequently. After about 20 minutes mix 2 teaspoons of corn starch with a little warm water. Mix this thoroughly so there are no lumps. Add this to the sauce to cause the sauce to thicken. You can repeat this until the sauce reaches the consistency you prefer in a gravy type sauce. In my case I used 3 teaspoons of corn starch. Once the gravy has reached your desired consistency add a 2 Tbsp. chopped parsley. The parsley will add nice color to your sauce. Once the Marsala sauce is done you can serve your Tri Tip. 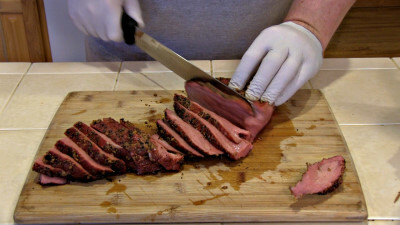 Remove the Tri tip from the foil and slice across the grain in 1/4 inch slices. 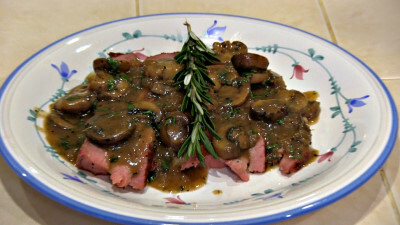 Distribute the slices over lapping in parallel on a plate and cover with the desired amount of Marsala sauce. Garnish with rosemary or parsley. Serve with garlic bread, rice or pasta if you desire. Red wine or a amber ale go great as well. By now your kitchen ought to be smelling pretty damn good! I hope you enjoy this recipe as much as we did.